Stamping, knitting, crochet, quilting and anything else I can do in my pink craft room. These were some of my favorite tags made with some scraps of decorative paper. I added the cardstock punch to the front and To/From on the back and the tab on the top which gave it stability. These could be made from paper to match your wrapping paper- wonder if they could be made out of wrapping paper.....? A month of Christmas Tags? I made Christmas tags to sell at the Holiday House at my church this past weekend. Thank goodness I took pictures because I sold all of them! I am going to share a few with you. Some are original ideas, others copied. Tags are fun to make and give as hostess gifts! Gable Green discontinued card stock with some decorative paper I had. Ric rac makes everything happy! Have you noticed the beautiful trees as you drive around town. Our favorite tree has been 'turned on' again. It looks like someone flipped the switch and it is glowing! This card uses the beautiful Gently Falling set and Hand Penned from the mini catalog. I took the Spice Cake designer series paper and punched circles to go behind the Lace Border punch. I like the way it makes the punch pop off the card! Keep looking for Christmas cards and tags I have been working on. My goal for the weekend was to get started on the cards I will sell in the upcoming Bazaar my church is having. I got one whole package of cards made! I was inspired by a card made by Laura Lin using this set and colors. I changed this one up a little. The card base is Wisteria Wonder. I ran the Very Vanilla through he Big Shot with the Lattice embossing folder. The image is stamped with StazOn black then I gave the flower the softest touch of color with Wisteria Wonder and Mellow Moss ink. I like the simple elegance of this card. I hate to admit it, but I am a dumpster diver and have raised a kid who dives too, so when Blair brought home a huge pile of deer antlers from the side of the road, my mind started whirling. I have been looking for a coffee table to go in our family room. So when my favorite handyman came to visit- we got to work making my idea come to life. First we put all the antlers in a bunch trying to make them look good from all sides. Then we wired and screwed them together. My favorite handyman- my Dad- used the saw to trim the "brains" as even as possible. The hardest part was shimming it up so the board we wanted to use would lie flat. Now it is at home in the family room. I love the rustic look with the rest of my furnishings. I was playing around in the craft room with my favorite Halloween stamp set of all time- Wicked Cool, and came up with this fun and easy card. I stamped the bats in the upper portion of the card by using a full inked stamp then stamping again without reinking. The Witch is orange tulle layered and bunched up with the Stampin'Up! black waffle paper over it. I pinched it all at the top then tied the ribbon around it. I clipped and tucked as needed, then stuck it all down with glue dots. The boots were stamped under the cape, and the hat on Pumpkin Pie card stock. For the final touch, I squirt Dazzling Details on the hat before I cut it out. You can get the waffle paper on clearance right now if you shop on my SU web page! At the last workshop we made these great treat holders that look like sour cream containers. They are super easy to make, and fun to decorate for whatever event you got going on. paper, stick it in the opening before you tape it closed. Now pay close attention. Fill your container with a treat, then pinch the open end closed so that it is perpendicular to the first closing. It should look like a sour cream holder. Use your good sticky tape to close this end. You can decorate the outside with fabric, ribbon, or tags. The container to the left was copied from Stampin'Up!. I used the new Spice Cake Designer Fabric to make a ribbon, added a Pool Party tag, and tied a Big button on with the Linen Thread. All Supplies can be ordered on my SU web site. The Halloween container is a little different in that I punched a hole in the paper before rolling it into a tube, then taped a window sheet over the hole. The rest is all the same, I just changed the decorations. It was so cute filled with Fall color M&Ms and candy corns, but I ate them before I took the picture! Let me know if you have questions or comments. I love making Halloween cards, and have spent way too much time in the craft room trying to make this one work! Finally, I am ready to share it's greatness with you! (We will be making this one in the workshop this week!) This card features the new Bigz L Die from Stampin'Up! called Peekaboo Frames, and the Simply Scored, both of which are in the Holiday Mini catalog. What a surprise when you lift the frame opening to find a spooky message! I squirt a little Dazzling Details on the witch's stockings just for fun. The other secret on this card is the way I altered the top note so it more closely mirrors the frame. I just cut it in half and fastened the ribbon over the middle. Another fun card using the Wicked Cool stamp set. I love this card. It is simple and pretty, and only uses the word from a Halloween set. In other words, you don't have to forget about your other stamp sets to make Halloween cards. Change the colors and the greeting and you have a great card for any occasion. We are making this one at the workshop this week. Let me know if you want to come. Meet the new love in my life- Stampin'Up! 's Simply Scored. It is so much fun to use, and so much easier than the one I already have. Truthfully, this one doesn't even belong to me. It is my friend Diane's and she let me try it out before I release it to her. The groves are just the right size, the stylus has two ends so you can make large or small scores, and the markers keep you from having to mark up your ruler so you can remember where to score. I highly recommend this to you crafters. So I must show you the card we will make in the workshop this week that I made using the Simply Scored. I was inspired by a card made by Jill Coleman at jillstamps.com. She gave instructions on how to do the accordion fold which I changed up a little to fit my card idea. You need a piece of card stock 5 1/2 by 11". Place paper on the scoring tool long ways and score at 1 1/2" and 5 1/2". Flip the paper like a pancake then score at 3" and 8". Fold and flatten with your bone folder. Then you are ready to decorate. Now those measurements will give you a skinny card, so I added mine to the front of a regular card so the finished card measures 5 1/2" by 4 1/4". I used the Frightful Sight DSP with Lucky Limeade and Cajun Craze card stock. The ghost is the Owl Builder punch using only the owls body and cutting off his legs :( The spiders are punched out of the paper with the 1" punch then glued to the back of the fold where the ghost are. I also used waffle paper on the back of the front fold to give the ghost a little something to peek around. The only other thing is the words on the paper from several Halloweens ago. They are perfect hidden in the fold behind the spiders. There is a long list of supplies, so leave a comment if you are curious about something used here. Even though I try not to put things off until the last minute, I do, and most of the time it causes a bit of grief. This time it was a happy! I was quickly looking for a way to wrap the awesome cards I was giving my friend for her birthday, when I dreamed up this great paper bag upscale! 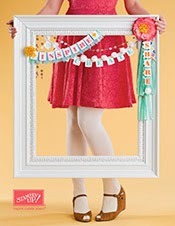 I used Stampin'Up Lace Ribbon Border punch. Look how easy it is to do..﻿﻿. First you fold the bag on the front so it will fit into the punch. Then you slide it into the punch right up to the crease that begins the side of the bag. ﻿﻿Now you are ready to fill with tissue paper, tea light, or put your stack of cards in a cello bag and drop it in! You can cut the bag any height to get the look you want or to cover your gift. In case you were wondering about the strange post- or lack of post, it's because I am trying to make this blog way more interesting. I have tons of projects ready to post if I can figure out where to post them! Check back soon for new cards, DIY projects and updates on my life with boyz. You will want to start by making fabric flowers. I made strips of fabric (wide strips make wide flowers and skinny ones make small flowers) by ripping the fabric. I liked the way the frayed edges look so I made sure to rough the edges up a bit. The next step is to tie the ends together in a knot- try not to have a tail on that end. Then all yo do is twist and wrap the fabric around the knot. Go ahead and do it, then unwrap it and do it again- you will figure out how to make a flower that you like. When I say twist, I mean turn the top edge of fabric to the bottom, wrap around the knot a little then twist again. When you figure your flower style, you may want to add a few drops of hot glue along the way to hold the flower in shape. When you are done, glue the end of your fabric under your flower. You will see that depending on the length of these strips, you may have a fat flower or a skinny one. All sizes are good! Now you are ready to assemble your board. Wrap the batting and fabric around the foam core and glue down with hot glue. Here is the view from the back. You can see the ribbons glued down and the brad poking through and opened on the back. To make this work using Stampin'Up brads, I modified it a little. It was easy to pinch the top of the SU Antique Brads off of the post. I then used strong adhesive to attach the tops to longer brads that I bought at the office supply store. Finishing the front is easy- cut flowers with the Big Shot using Fun Flowers Bigz L dies. Mist lightly with water and crinkle up. Unwad them and let them dry. Start planning where your flowers will go and which paper flower will best accent your fabric flower, then hot glue it all together! You will love the way your board turns out- great for your own use or as gifts. 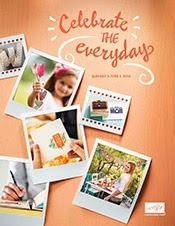 I am hosting the August workshop this week featuring products from the new Stampin'Up! Idea Book and Catalog. I was poking around on the SU web site and found this great card Diane Sisneros made using the Button Buddies stamp set. As usual, I changed some things to fit our workshop, and am very pleased with the results! Please join me this week for our workshop- you will love it! Stampin'Up! sells these really cool vinyl pieces to decorate walls, glass, vases, anything you can think of. Well one night a commercial came on for computer cases that were really cute, but my husband said I didn't have the right computer for the cuteness. So I ordered the Flower Garden Deco Elements to make my own super cute computer! When you get yours, follow the directions in the package. I changed a few things to make this one work better for me. First, I cut up the paper so I could lay out the design to fit the top of the computer. Then I transfered the vinyl , starting at the center and working my way out. It was much easier to transfer in smaller pieces rather than the way it is packaged. So I added the flowers. I love my very stylish laptop! I am excited to try something new this summer. Instead of having the regular stamping workshop that I host once a month, I am hosting a Project Workshop. The first one is next week. We are making a card organizer. I chose this first project for selfish reasons- I can never keep up with birthdays. This is the answer! Please join me for this handy project. If you were unable to make it to the workshop this month, don't worry! I will post the cards we made and the directions so you can make them at home. Feel free to be inspired by these cards and change them up to fit your stamps- that's what I did! This card was inspired by SU demonstrators, Robin Merriman and Tonya Bowers. It is very simple and easy to adapt to any occasion. Start with a Whisper White card base. Layer Basic Black and Daffodil Delight cs. On another layer of Whisper White, stamp the flower from Awash with Flowers in Stazon black ink. Then stamp the stems in black and the saying of your choice. Color the flowers and stems with Garden Green and Daffodil Delight markers. Layer the card together and you are done! Simple and pretty. After all that whining I did about not getting anything on my blog- here is the card I made yesterday! It is very similar to the one a fellow demonstrator had published in our SU newsletter. It is very easy to say "I never have any ideas", so try starting with a card that you like and make it your own. I didn't have the same materials as the original, so I just used what I had! I had high hopes for this blog- making cards, posting pictures, sharing funny things that happen at our house, but somehow it is too hard for me to do it consistently. I really wanted to provide great information on our ski trip- mostly because I couldn't find any good info before we went. How embarrassing that the last post was April 13th right in the middle of our fun week there? I stamped a great card yesterday but haven't taken a picture or posted any information about any stamping in weeks. All this to say I am sorry for having such a pathetic blog! And if anyone knows an easier way to keep current- pass it on. Everyone is moving kind of slow today- I mean everyone. Breakfast was a little later, warm-ups were a little slower, and they were calling skiiers to take thier turns. I had to giggle at warm ups this morning when the Austrian kids all moaned when we were warming up. The other funny thing is the dogs. There are about four lake dogs here. They run free, cruise under the tables when we eat, and fish or swim in the lakes. The funniest thing is when they join us for warm ups. Every morning after breakfast, Ann leads a warm up with music. As soon as she turns on the music Frankie and Amber run over and start playing with each other. They wrestle, growl and frisk all over everyone's towels. Ann says they do it every morning. This morning I went to the physical therapist with Patrick. He is from Sweden and has been skiing and working here for about 8 weeks. He hurt his elbow and needed another session with the therapist. I struggled through the night with side pain, then had to get David to help me out of the bed. I knew I would feel better if someone could poke around and give me a little clue as to what I may have done. Sure enough the therapist says I pulled my oblique and the intercostal on my left side. I feel sure it happen when they were yanking me out of the water yesterday. She gave me some heat and stem, then did a little deep tissue work. It does feel better. I will not ski today (or jump), and see how it goes tomorrow. I am thinking I may save myself for tennis. Baily and I made a deal that if I can we will jump together tomorrow. Hoping to post more pictures later this afternoon. Jonathan said, "your all over the place out there. Your hands are way up here, your working too hard- what are you doing?' But he said it with an acent so it was all good! If you look at these pictures compared to Alex's you can see how terrible my form is. I need to lean more forward, weight in the front leg, relax my arms, lead with my hips, blablabla. Today I pulled a muscle in my obliques- it hurts to take a breath. I hope that the ice I have been putting on it and Advil from the Zachery Walmart will ease the pain and allow me to ski tomorrow. If not I will have to write down all my ski tips and focus more on my jumping. Josh said I should have a go! Really everyone thinks I should try. David has not agreed to it yet. Welcome to my little collection of projects, funny boy things, and rambling ideas. I am a Stampin'Up demonstrator so most of the cards you see here are made with Stampin'Up supplies.